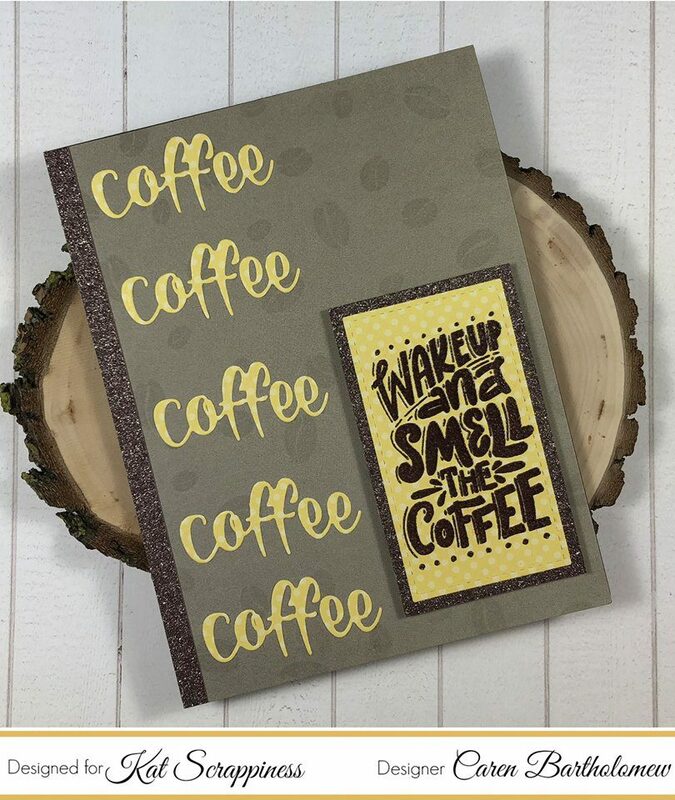 Welcome to National Coffee Day Blog Hop at Kat Scrappiness! 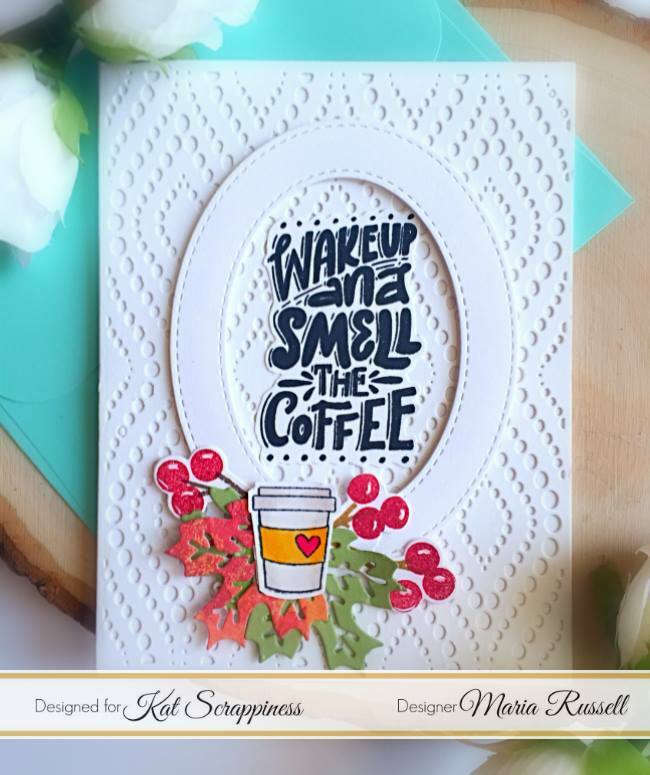 We are super excited that you have visited us from the Coffee Loving Cardmakers blog. To celebrate National Coffee Day, we have many coffee related projects to share with you today. 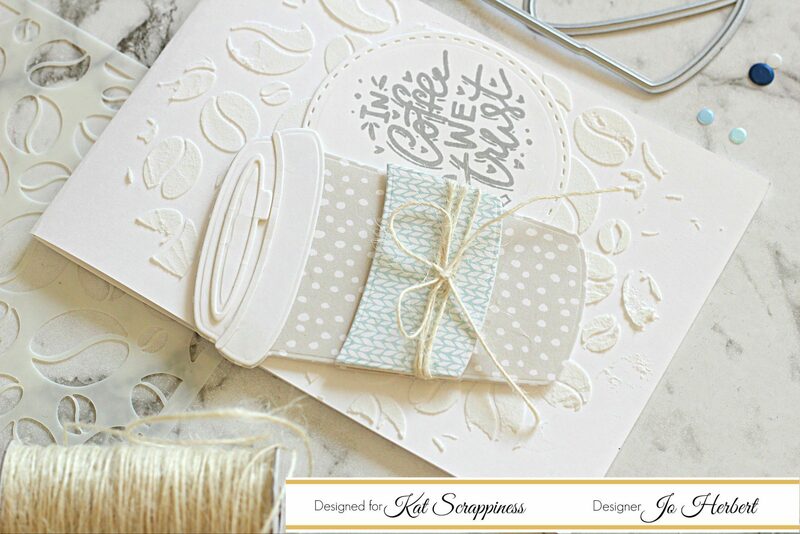 We are also giving away two $25.00 gift cards to Kat Scrappiness, as well as a SECRET coupon code! To enter the giveaway, simply leave a comment on this blog post letting us know your favorite coffee related project from our blog post today as well as your favorite Coffee Related Product at Kat Scrappiness. We will choose TWO winners who will each win a $25 gift card to Kat Scrappiness to spend as you’d like! We will announce the two winners on Monday, October 8th right here on our blog! 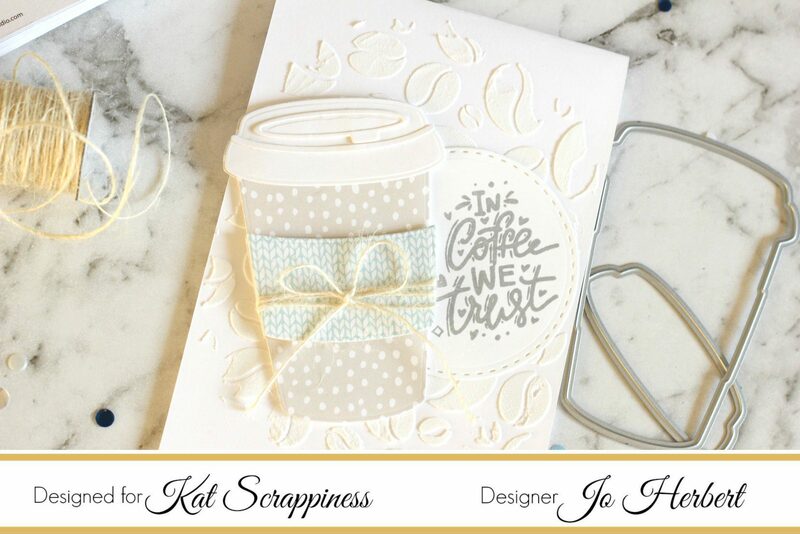 More details will be posted later on in this post but let’s get on to the coffee loving projects made by the talented designers here at Kat Scrappiness! 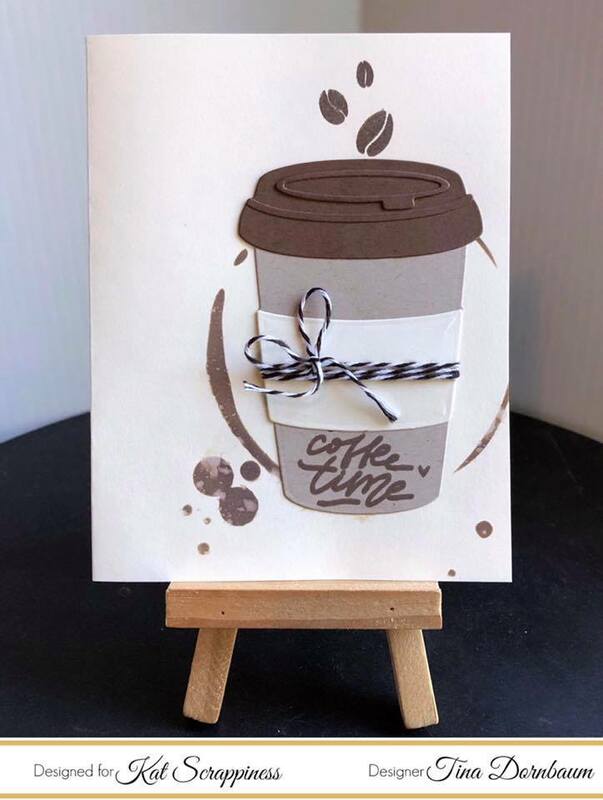 Tina used the “Layered Coffee Cup” dies by Kat Scrappiness to make this cool coffee thee card! Product List: “Let’s Get Caffeinated” stamp set and Got Coffee die. Maria has played with the “Let’s Get Caffeinated” stamp set, with the Peacock Backdrop die and the double-stitched oval dies, all from Kat Scrappiness. I made this card using an ink blending technique over my chevron stencil. 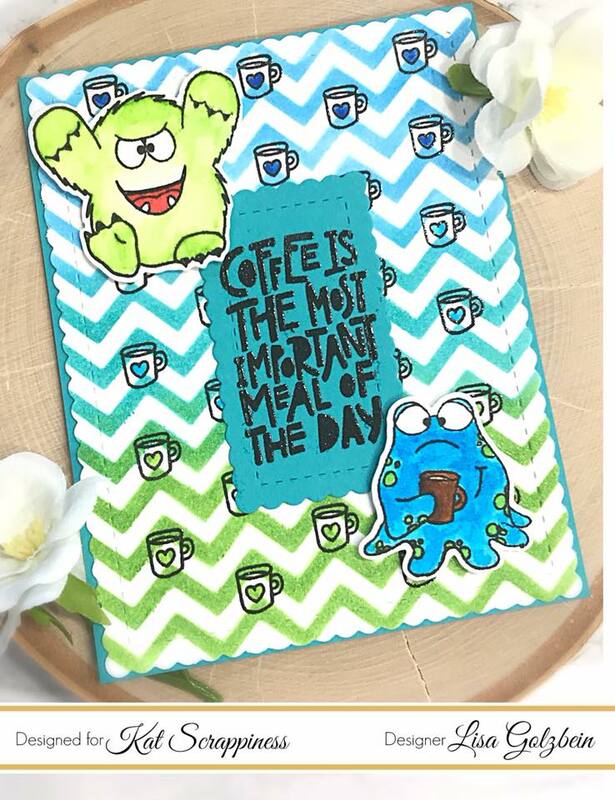 These cute monsters frame the funny sentiment from the new “Let’s Get Caffeinated”Stamp Set now available at Kat Scrappiness! Jess has used 2 new product from September release that has gone really well together. Check out the Peacock Backdrop die, “Let’s Get Caffeinated”Stamp Set and “Layered Coffee Cup” dies. 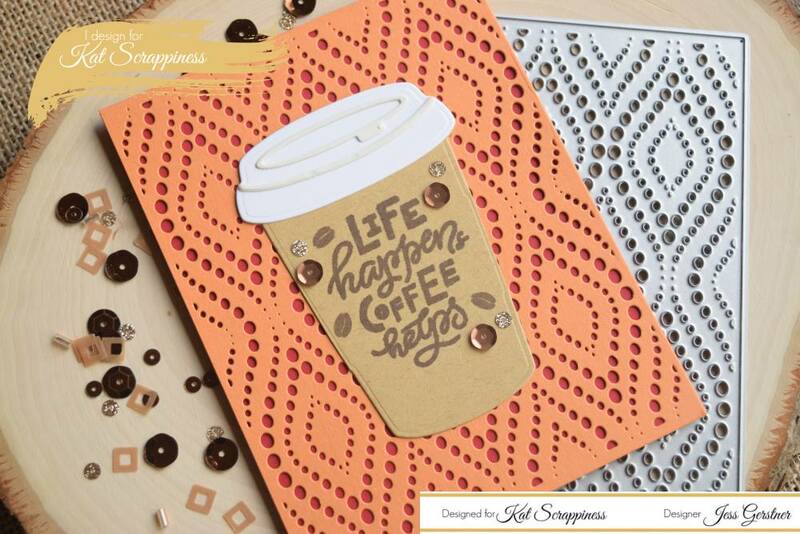 Cynthia has used a lovely array of Kat Scrappiness with the “Let’s Get Caffeinated”Stamp Set, Coffee Bean Stencil , Stitched Circle Dies & Gold Jewels . Secret Coupon Code for Coffee Lovers! Remember to enter our Giveaway! Continue on the Blog Hop by visiting the wonderful companies that have lined up as Super Sponsors listed below!